"60 Many therefore of his disciples, when they had heard this, said, This is an hard saying; who can hear it? 61 When Jesus knew in himself that his disciples murmured at it, he said unto them, Doth this offend you? 62 What and if ye shall see the Son of man ascend up where he was before? 63 It is the spirit that quickeneth; the flesh profiteth nothing: the words that I speak unto you, they are spirit, and they are life. 64 But there are some of you that believe not. For Jesus knew from the beginning who they were that believed not, and who should betray him. 65 And he said, Therefore said I unto you, that no man can come unto me, except it were given unto him of my Father. 66 From that time many of his disciples went back, and walked no more with him. 67 Then said Jesus unto the twelve, Will ye also go away? 68 Then Simon Peter answered him, Lord, to whom shall we go? thou hast the words of eternal life. 69 And we believe and are sure that thou art that Christ, the Son of the living God. 70 Jesus answered them, Have not I chosen you twelve, and one of you is a devil? 71 He spake of Judas Iscariot the son of Simon: for he it was that should betray him, being one of the twelve." A disciple is a learner or a follower. Disciples are followers of a master or a teacher. In the case of Jesus, he had a following and a rather large one at that. Not every one who followed Christ was a genuine disciple. In John 6:60-71, we can see at least three categories or types of disciples. First, we see there are "disciples-in-name-only" (vs. 60-66). Second, we see the "true disciples" (vs. 67-69). Third, we see Judas Iscariot, a representation of "false disciples" (v.70-71). A. The Nominal Disciples - these are disciples who follow Christ for what they can get out of Christ. In other words their interest of Him was solely based on curiosity and selfishness. They were merely using Christ for their own personal gain. It is a relationship that is shallow and meaningless. These disciples are not true disciples, hence they are not saved. B. 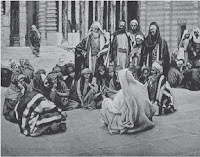 The True Disciples - these are disciples who really want Christ. Peter, said it right..."Lord, to whom shall we go? Thou hast the words of eternal life." They are followers of Christ who clearly demonstrate a true dependency of Christ. They are saved. They are not saved because they follow, rather, they follow because they are saved. C. The False Disciples - these are disciples who willingly deny Christ. They promote false doctrine. They look like true disciples, they may even be in company with true disciples, but within they are full of dead men's bones. They may even preach and perform miracles, but in the end, Christ rejects them, and considers them "workers of iniquity."